(Newser) – "We're not going to gamble with the lives of the people of South Carolina," says Gov. Henry McMaster, who has ordered the mandatory evacuation of the state's entire coastline, effective noon Tuesday, as Hurricane Florence closes in. McMaster says lanes on four main roads leading from the coast will be reversed and schools and state offices in the eastern half of the state will be closed, the State reports. The order will affect an estimated 1 million people and another 245,000 are under a mandatory evacuation order in low-lying areas of coastal Virginia, the Guardian reports. 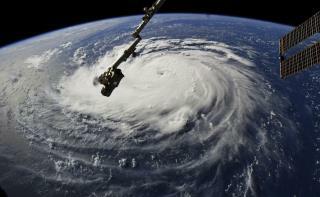 Florence is expected to strengthen to a Category 5 hurricane Tuesday before hitting the Carolinas with terrifying force Thursday. I always laugh when I see people running to the stores to buy supplies...What happens if you don't have a warning? If you live in a hurricane zone wouldn't it behoove you to lay in supplies throughout the year? Hope they all get to higher ground and Florence blows herself out before wreaking havoc. Suddenly Puerto Rico isn't looking so bad again. Stay safe everyone, pack an extra life jacket! I know me and Hawk are directly in it's path. Brawne, Johnny and Gart are likely gonna get some of it too.